Welcome to our largest dog breed information and pictures. This is a big guide devoted to big dogs. Don’t forget to scroll down for our Biggest Dog FAQ where you’ll find answers to all your largest dog breed questions. Including the biggest dog in the world! You can use the links in the menus to take you to the breed or information you are especially interested in. There is something special about really big dogs. Something that makes us feel warm and safe. From the story of Peter Pan to the tragic tale of Gelert, literature and folklore brims with legends of giant dogs that loyally protect their human friends. Many of the giant dog breeds living among us today have a long and proud history of serving mankind. And we are all curious to know which is the tallest, heaviest, and biggest dog in the world. You’ll find plenty of fascinating facts about your favorite large breeds here plus the answers to all your big dog questions! How big are the biggest dogs? When we talk about largest dog breeds, we are not talking about the popular Labrador Retriever or the German Shepherd Dog. Though they are certainly quite big dogs – especially when they are taking up your favorite armchair. No, we are talking really big. Giant even. These are dogs that mostly weigh in at over 100lbs. Some are big by weight, some are big by height too. We’ll cover them all. The dogs are listed in approximate ascending order of body weight. Remember that these body weights are just a guide. When we’ve looked at some of these dogs breed by breed, we’ll talk a bit about what it means to be a giant among dogs. And at the downsides of being the biggest dog in the world. We’ll consider some of the ups and downs of living with a very large dog. Including information on choosing a large breed dog, and caring for it. Some of these giants are very muscular, others are very tall and surprisingly elegant for their size. Next to the name of the breed we’ll give you the weight range and in brackets the height. The weights we’ll give you are the range expected for males. And heights are maximum expected for males. In most breeds, adult females weigh and measure around 10% less than their brothers. Let’s kick off with the smallest of the largest dog breeds. The gorgeous and graceful Scottish Deerhound. 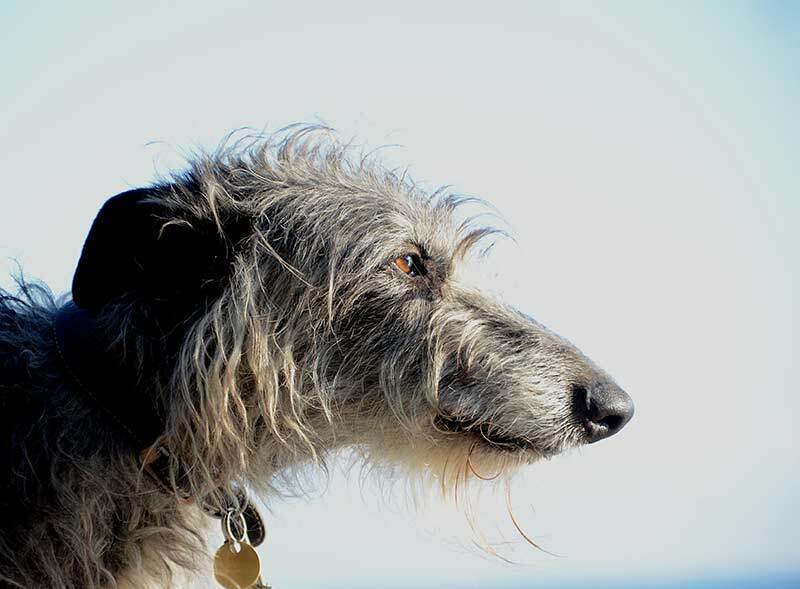 The Scottish Deerhound – known simply as the ‘Deerhound’ to our UK readers, is the lightest and ‘raciest’ of our largest dog breeds. Built for speed, these beautiful dogs were originally bred, as the name suggests, to hunt deer. The lightest dog in our selection, this is a hound that really needs to stretch his legs and run each day. The rest of the time, he’ll enjoy stretching out on your couch. A Deerhound could make an enchanting and eyecatching pet, but there’s a catch. Deerhounds have a significant 15% risk of osteosarcoma (bone cancer) and 10% risk of heart problems. A 2004 health survey gave Deerhounds a lifespan of just over 8 and a half years. Liver shunt is another problem in the breed and puppies should be screened for this. The Deerhound looks a bit like a huge hairy greyhound and has the same quiet and thoughtful demeanor as his smaller cousins. He’s unlikely to guard their home, but will be a loving companion for his family. This is a friendly, hairy, loving and lovable dog whose origins lie in Switzerland. The Bernese Mountain Dog was developed as a farm dog, nimble and clever enough to herd livestock and yet strong enough to pull a cart. In theory this is an ideal family dog. Great with kids, the Bernese is one of the more popular big breeds. With a kindly temperament and a more moderate size than some of our other giants. However, all is not ideal in the health department. Bernese Mountain Dogs have a very high rate of cancer. In one study of nearly 400 dogs, over 45% succumbed to the disease. In a 2005 study carried out by the Bernese Mountain Dog Club Of America the average age at death of over 200 dogs, was 10. The median age of death in a UK study was only 8 years. 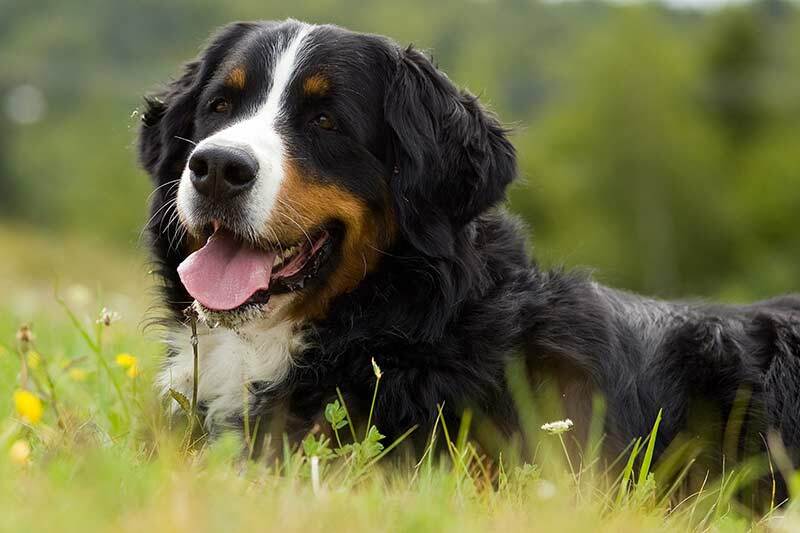 The Bernese has a moderately long and heavy coat and sheds. And is unlikely to be comfortable in very hot climates. Regular grooming is essential and will help to minimize the hair on your couch and carpets. 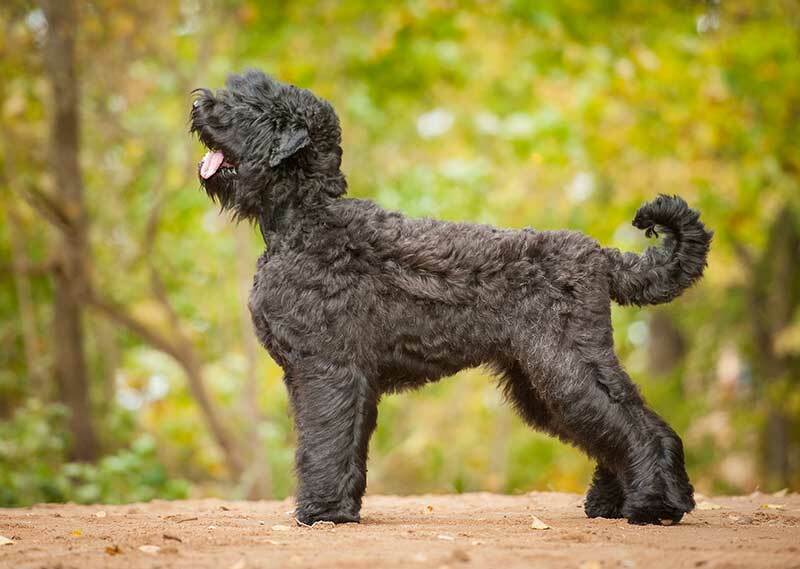 The Black Russian Terrier is known as the Russian Black Terrier in the UK. The Kennel Club describe this breed as “large and imposing” with “natural guarding instincts”. A relatively new breed, the Russian Black Terrier was developed in the 1930s and 1940s in Russia, from a mix of 17 different dog breeds. The biggest problem for this breed is it’s lack of genetic diversity and low numbers. The Institute of Canine Biology have placed the Russian Black Terrier on it’s ‘critical list’. This is because the population numbers have fallen so low in the UK. Black Russian Terriers are few and far between in the USA too. An adult Komondor in full coat is quite a sight to behold. 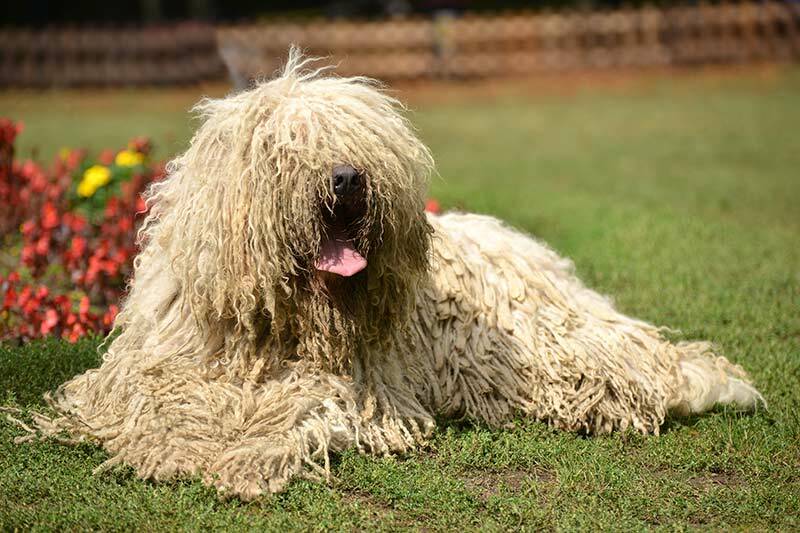 While the Komondor may look from a distance like a woolly sheep, this is a seriously large working dog with very strong guarding instincts. The breeds was developed in Hungary for guarding livestock and when adult has an unusual corded coat. Each cord can be up to 12 inches long so that the resulting coat weighs more than that of any other dog breed. As with all guarding breeds it is vital that you put a lot of effort into socializing a Komondor puppy, so that he will be safe around visitors and in public when he grows up. This is not a suitable breed for families with small children. Some Komondors can be noisy too. These are also big dogs that eat a lot and like many big breeds are susceptible to hip dysplasia, and to bloat. Rottweilers have long been popular as protection dogs. And are increasingly popular as family pets. They are an ancient breed whose origins lie in Germany. The Rottweiler probably began their career as cattle dogs, but when cattle driving became illegal, this multi-talented breed became known as a ‘butcher’s dog’. This is a deeply loyal and courageous breed. They do however need proper training and are best owned by an experienced handler. A study published in 2000 showed that, along with Pitbulls, Rottweilers accounted for half of human deaths attributable to dog attacks during a 20 year period. This does not mean that all Rottweilers are aggressive, or dangerous. And the number are partly because both breeds are very popular. But it shows that there is a potential for harm that needs proper consideration. And it would be wrong to ignore that fact. The lifespan of the Rottweiler isn’t long. In a recent study (see O’Neill below) the median age at death of over a hundred Rotties was just 8 years. Cancer was a big problem for this breed too, with rates of over 45%. Here’s our full guide to the breed. You can also check out the many popular Rottweiler mixes. The Great Pyrenees is known as the Pyrenean Mountain Dog in the UK where it is classified in the pastoral (herding) group. It is a tall and predominantly white dog whose origins, like many of our biggest dog breeds, lie in herding and guarding livestock. You’ll need plenty of space to accommodate on of these handsome dogs in your home. And a well fenced property if you don’t want this independent dog to wander off. The magnificent and profuse white coat may have served the original purpose of defending the dog from wolf attacks as well as protecting it from the cold Pyrenean climate. This is a shedding breed and needs some grooming. Health problems include hip dysplasia and a relatively new neural degeneration disease. There are tests for these conditions so make sure you ask to see certificates before purchasing a puppy. Check our our breed center for more information. 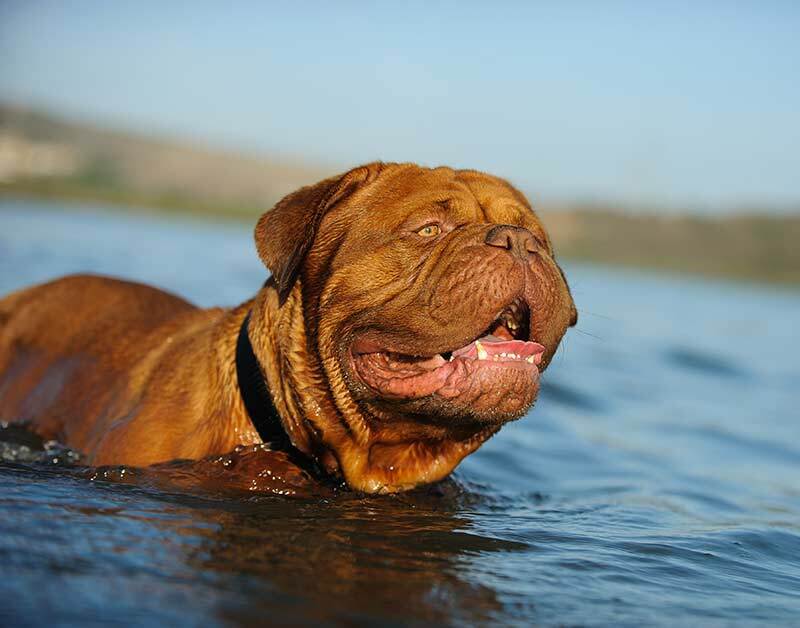 The Dogue De Bordeaux is a muscular mastiff with a rich red coat, that originated in France several hundred years ago. You can find out all about the history and characteristics of this interesting breed in our detailed guide. This is a guarding breed and needs intensive and thorough socialization, but perhaps the biggest problem with the Dogue is its greatly reduced lifespan. Check out that guide before you buy! Sadly, some breeders have also introduced a marked degree of brachycephaly into the breed, with its associated consequences (breathing difficulties and overheating). The dog in the photo above can be identified as brachycephalic by its short muzzle with accompanying skinfolds, and by the severely pinched entrance to its nostrils. 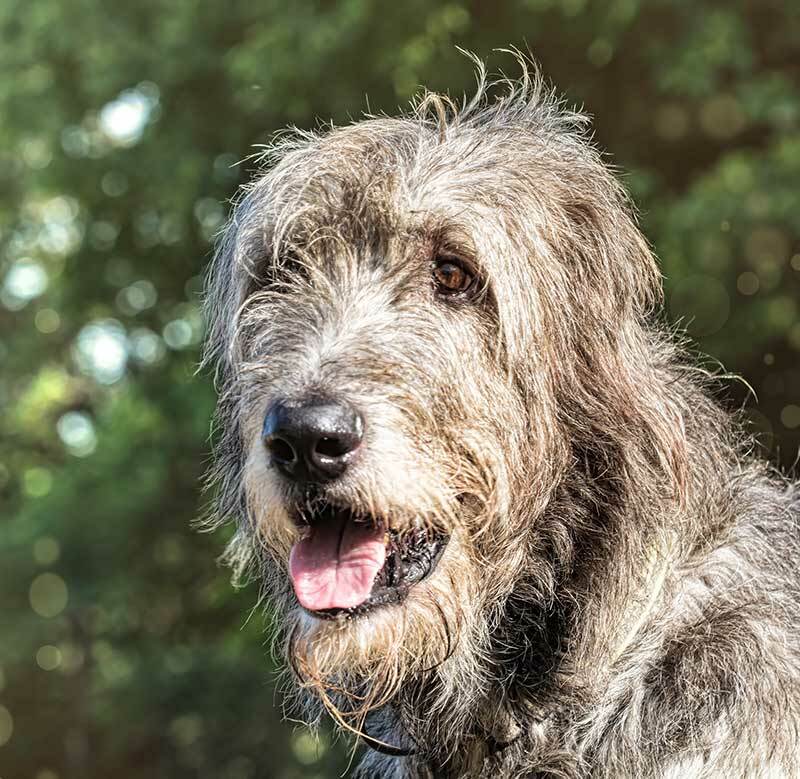 The Irish Wolfhound looks for all the world as though he just stepped off a medieval film set. This is my personal favorite of all the giant breeds and surely one of the most striking of all our breeds in appearance. 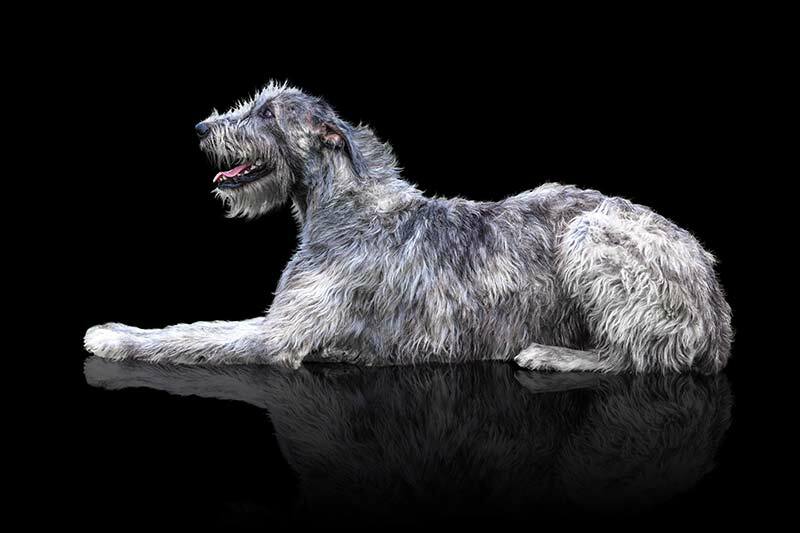 The Wolfhound is our tallest hound standing as he does at a minimum of 32 inches at the shoulder. His great size however, is not an advantage when it comes to health. And the breed has a strong propensity for heart troubles. A study published in 2000 looked at over 500 wolfhounds and found heart problems in over 40% of them. You’ll need plenty of space if you bring one of these beauties into your life. And a passion for long walks! Bullmastiffs were developed in the 1800s by mixing Mastiff bloodlines with Bulldog bloodlines. This idea was to develop a more protective and aggressive Mastiff type breed. According to a health survey carried out in 2004 in the UK, Bullmastiff have a median lifespan of 7 and a half years. Lymphoma – a form of cancer – was responsible for 37 % of the 96 deaths in the report. This is a powerful, protective dog that needs very thorough socialization, and training. From a safety point of view, it is a breed best suited to an experienced and knowledgeable owner. 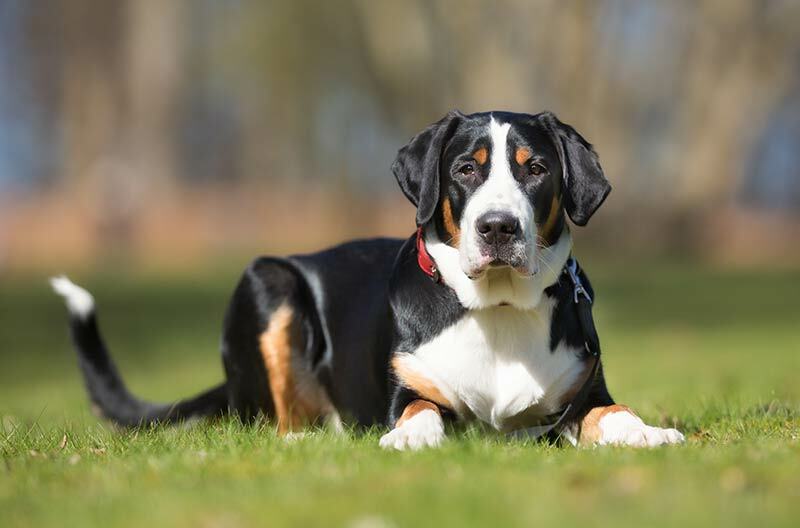 Unlike many of our other large mountain breeds, the Greater Swiss Mountain dog has a short, easy care coat. This was another, multi-purpose, hard working farm dog, capable both of pulling heavy loads and of helping to drive cattle to market. Modern Greater Swiss Mountain dogs are generally friendly dogs, though aggression has occasionally been reported in the breed. Often considered to be one of the healthier big breeds, a 2001 health survey revealed that the most common problems in the breed included bloat, and epilepsy. This is a well constructed dog that should be able to lead an active life. This is a breed widely known for its large size, shaggy coat, and wonderful temperament. 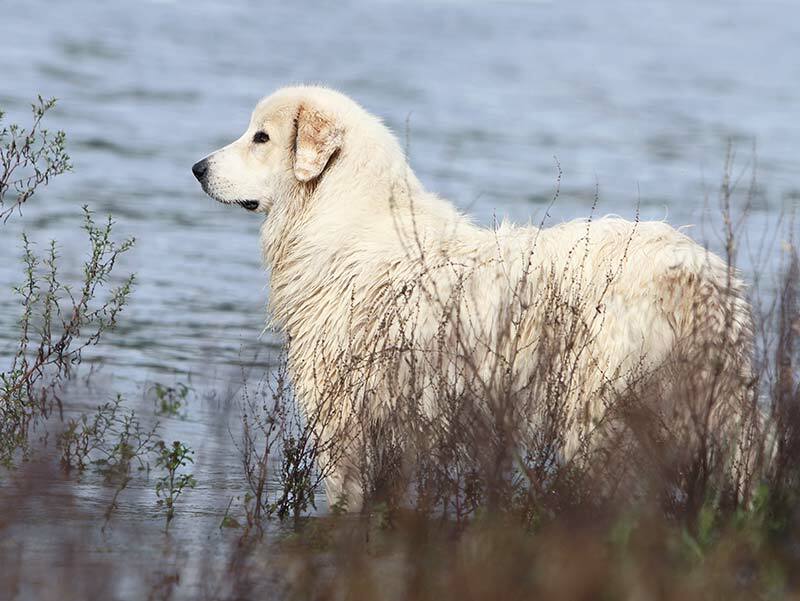 Bred to work in the freezing waters of Northern Canada the Newfoundland is a powerful swimmer and a favorite breed for live savers and water rescue. On the downside, Newfies can be heavy ‘droolers’ and in common with several other large breed dogs Newfoundlands are prone to heart problems, and hip dysplasia. They are also susceptible to a bladder/kidney problem that every puppy’s parents should have been tested for before breeding. In the 2004 UK health survey the median age at death for Newfoundlands was 9 years and 8 months. 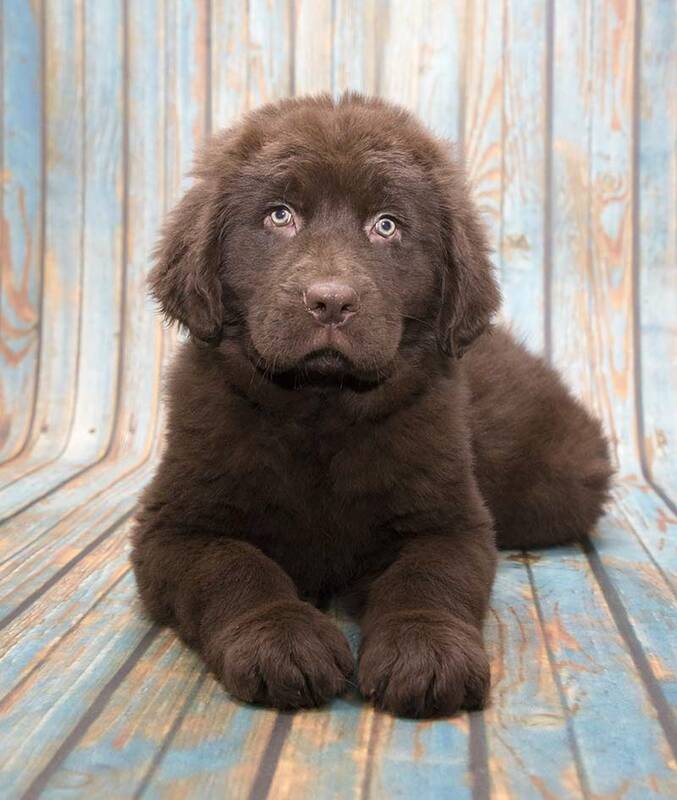 The Newfie comes in three colors, brown, black or black and white and is a gentle giant that makes a lovely family dog for those with sufficient space in their lives. Read more…. The Anatolian Shepherd Dog is a breed developed to work alongside nomadic herding peoples in Turkey. The principle role of the Anatolian Shepherd is to guard livestock. This is a very hardy, short, or rough, coated working dog with a natural guarding instinct and suspicion of strangers. The Anatolian breed may be longer lived than most of our giant breeds. There were only 23 deaths recorded for this breed in the 2004 UK survey, but they showed a median age at death of over 11 years. As its name suggests, the origins of the Neapolitan Mastiff lie in Southern Italy. Sometimes referred to as Mastinos, or Neos, the breed is an ancient one whose ancestors go back to Roman times. Sadly, in addition to high risk of joint problems, modern Neapolitan Mastiffs have suffered from exaggerations in conformation. These are not an ideal first dog, nor are they usually a great dog to have around small children. This is a guarding breed. The United States Neopolitan Club point out that “Neapolitans are sometimes jealous of attention given a child by an adult”. And as the Club also notes, these are dogs that can be very wary of visitors. This is another working dog originally bred to protect homes and guard livestock. The Tibetan Mastiff has hit the headlines on several occasions for being both an ‘ancient’ breed, and an ‘expensive’ one. Despite its name, in appearance, this is a breed that is more ‘mountain dog’ than ‘mastiff’. Coming in at number 95 in the AKC’s list of most popular dogs, the Leonberger is one of the few really big breeds that rarely drools. 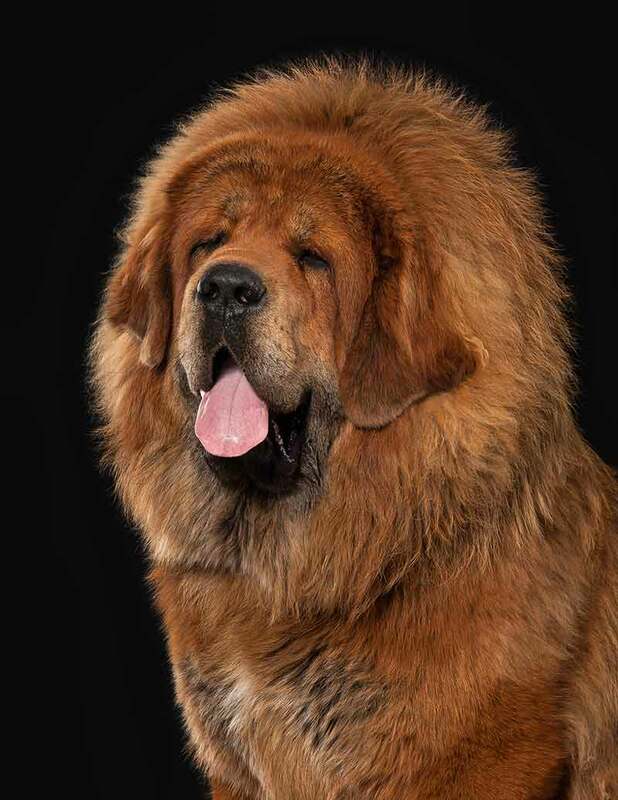 Rumor has it that the mayor of Leonberg helped to create the breed because he wanted a dog with a lion-like appearance to compliment the name and crest of the town. As with most big breeds there are longevity issues with this beautiful dog. The 2004 study in the UK reported on 47 Leonberger deaths and found the median age at death to be 7 years and one month. Cancer was the leading cause of death accounting for the demise of just under half of those dogs. Breeders have however, been successful at reducing rates of hip dysplasia in the breed. The Leonberger is quite agile for a big dog and sometimes works in search and rescue, as well as being a companion breed. 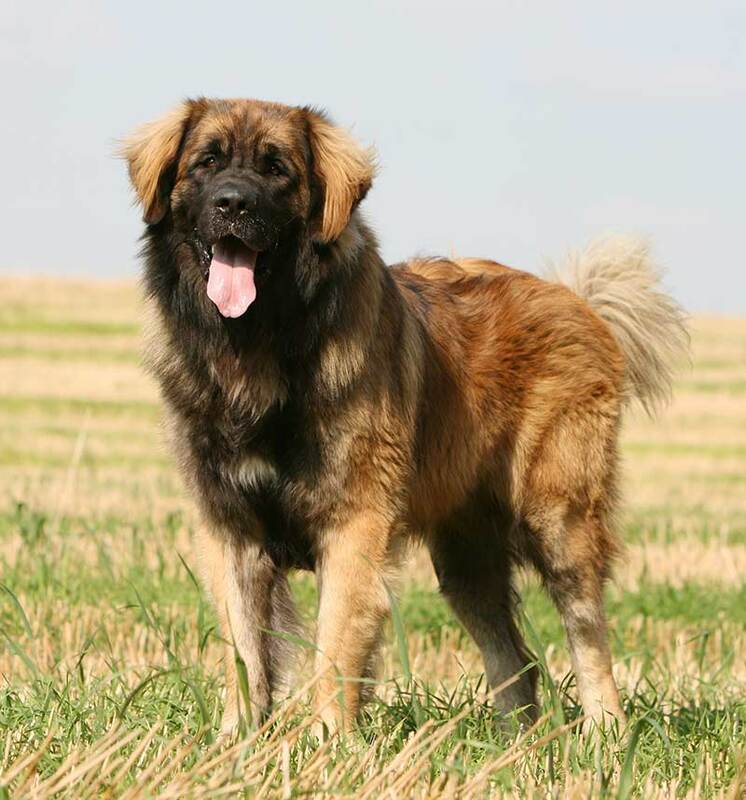 Like most Mountain Dogs, the Leonberger has a substantial and very warm coat, and will shed. Made famous by the movie ‘Beethoven’ The St Bernard is a familiar breed to most of us, and is the 49th most popular breed in the USA. St Bernard history goes back a very long way, and while some of the tales you hear are speculation there are records that tell us quite a lot. We do know that from the 1700s St Bernards were regularly employed by monks in a hospice located in the Swiss Alps. Their job was to rescue snowbound travelers, and there is no doubt that many lives were saved by these giant dogs. With a lifespan of just 7 years or so, this is another big breed that suffers with heart problems, cancer and hip dysplasia. And like other big breeds is susceptible to heatstroke and bloat. 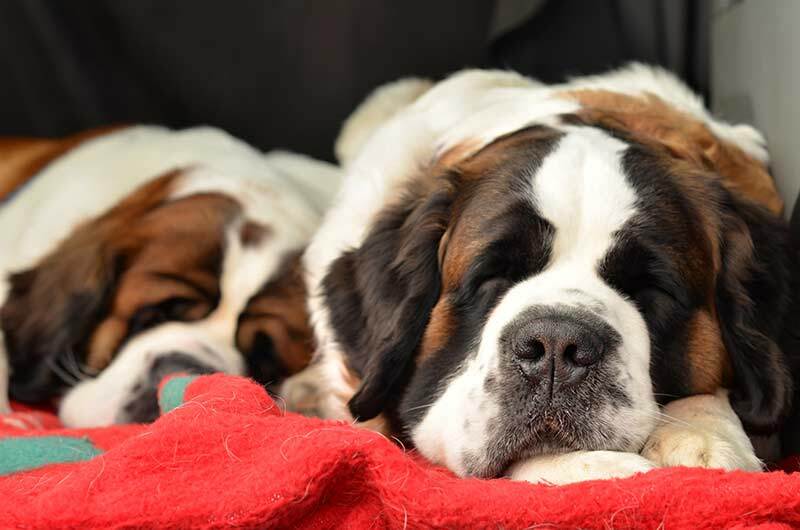 The St Bernard does however have an exemplary temperament and if you have space enough for one of these giants, they will make you a gentle and kind companion. Another familiar breed, Great Danes often hit the headlines. Usually because one has broken a record of some kind or sometimes for eating, or costing a lot. This is a very tall dog, and no lightweight! 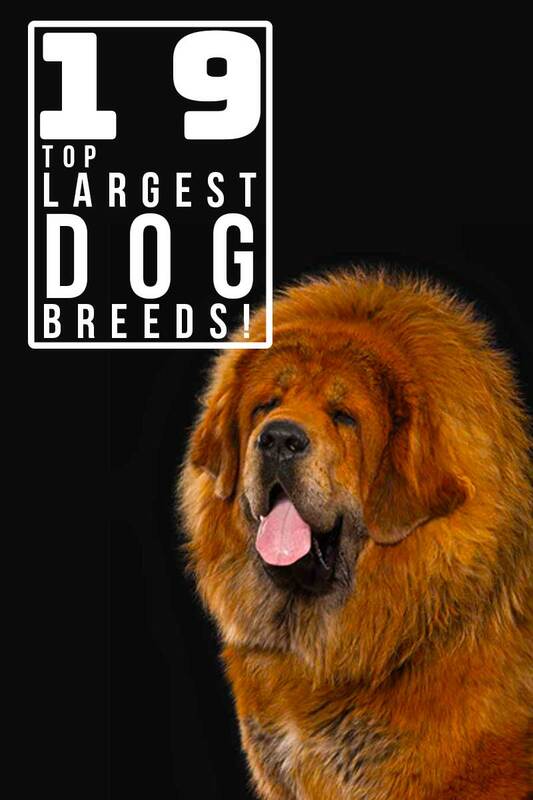 The popular giant is one of the most numerous of our giant breeds and the 14th most popular dog in the USA. Being a contender for the biggest dog in the world isn’t all fun. 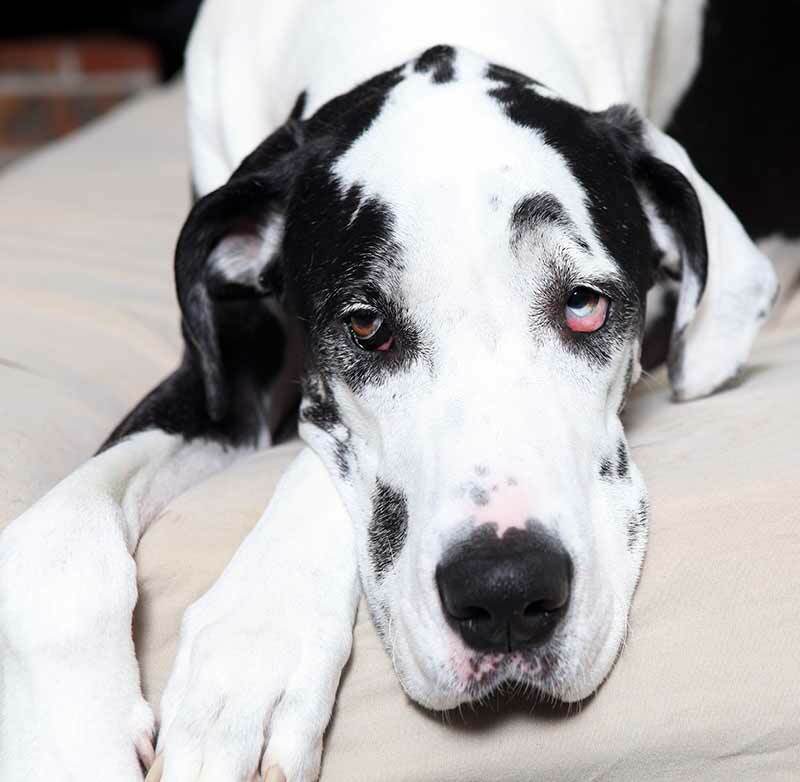 Great Danes suffer from gastrointestinal problems including bloat, heart troubles and bone cancer. Danes come in many colors but one of the most popular – the harlequin – shown in this image is associated with birth defects. In the USA Danes are often ear cropped, a painful procedure carried out under anesthetic on three or four month old puppies. You don’t need to crop your puppy’s ears if you don’t want to, ear cropping has no value other than for cosmetic purposes. If you are thinking of buying a Great Dane, especially a harlequin, do some research first to make sure you use a knowledgeable breeder who follows best practice for avoiding some of these issues. Read more in our Great Dane breed guide. Originally bred as a farm dog and guard, the Boerboel is a powerful breed, with strong protective instincts. Bred to have sufficient aggression and courage to take on large African predators, the Boerboel needs very thorough training and socialization, and experienced handling. 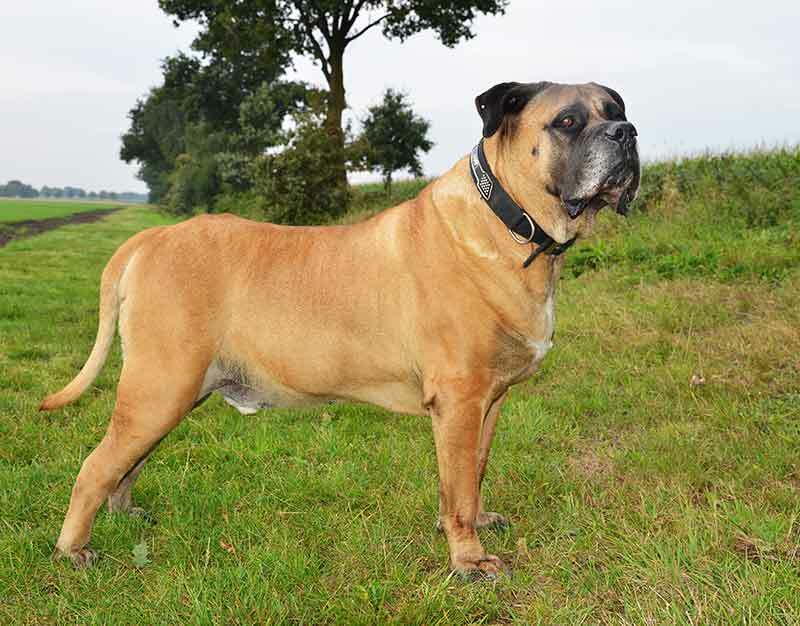 The American Boerboel Club encourage owners to participate in a sport or activity such as Schutzhund to channel the dog’s energy and confidence in a useful way. This is not an ideal breed for an inexperienced owner or those with small children, and ownership of Boerboels is banned in a number of countries. The Mastiff, or English Mastiff as it is sometimes known, is an extremely large dog. Most people, having seen one for the first time, are tempted to compare it with a small pony! Fortunately, despite its ancient origins as a fighting and guarding breed dating back to Roman times, the Mastiff is as docile as it is large. Unfortunately the breed has suffered from a small gene pool (only 14 individuals were left at the end of WWII) and from poor breeding practices on the part of some breeders. The Mastiff truly is a gentle giant, and wins the hearts of all who get to know him. But there is a way to go before this lovely breed can be considered healthy. 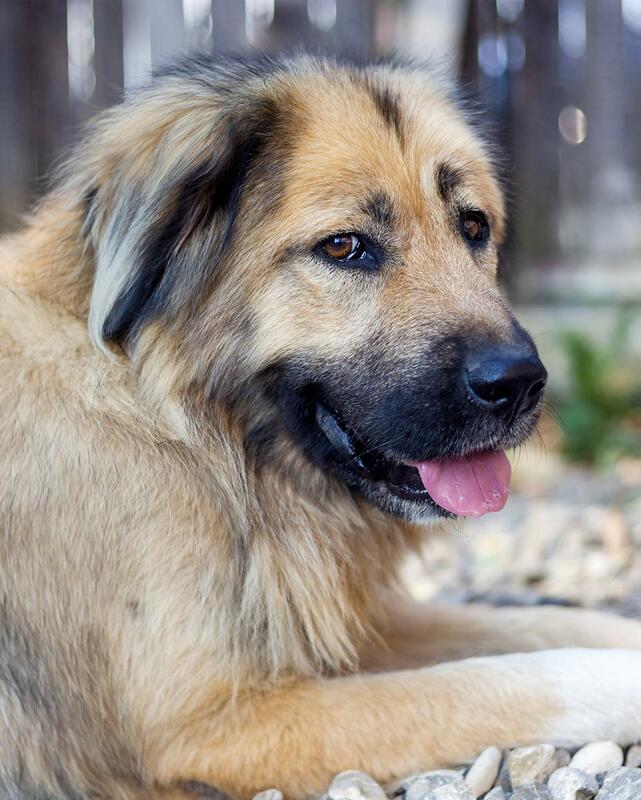 Also known as the Russian Bear Dog, the Caucasian Shepherd is another massive guarding breed. 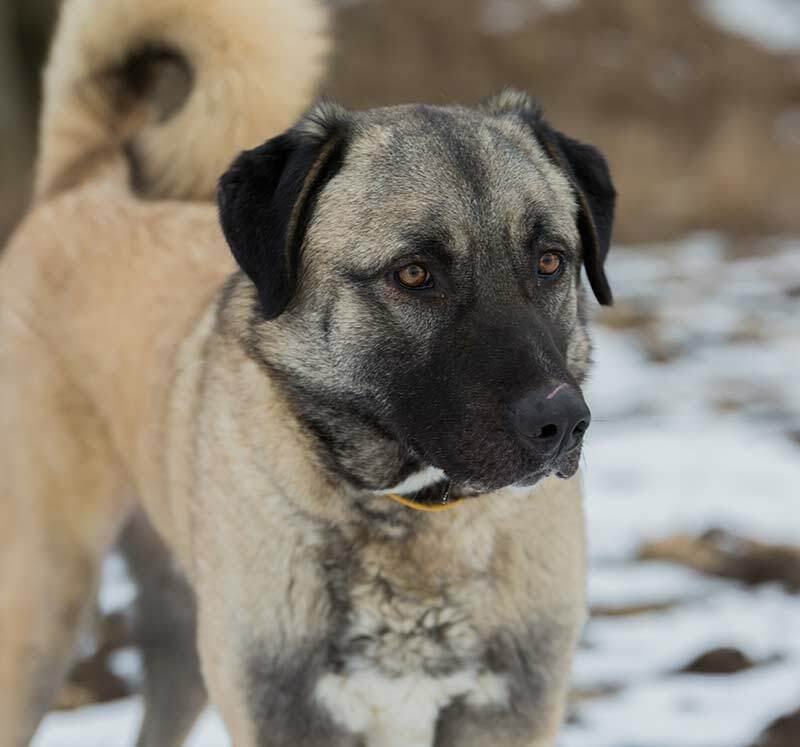 This tall and thick coated dog was bred to fight wolves and protect flocks of sheep in the mountainous Caucasus region. Some aspects of big dog ownership cut across all breeds. We’ll look at those in the health and care sections below. First, here are some of the most common questions that we are asked about big dogs. #Q What is the biggest dog in the world today? The tallest dog in the world today is a Great Dane from England called Freddy. Freddy is the biggest dog in the world by height. The heaviest dogs in the world tend to be Mastiffs, but celebrating massive weights can be inappropriate as it may encourage obesity. So we’ll stick to how tall dogs are when talking about the biggest dog in the world ‘title’. #Q How many different types of big dogs are there? Many in the working group are molosser or mastiff type dogs. Including the Dogue de Bordeaux, Neopolitan Mastiff, Bullmastiff and the Mastiff. Most are short or rough coated and have their origins as fighting and protection dogs whose duties included other more practical roles in rural farming communities. These are dogs that live to protect their families, and some can be very reserved with strangers. The Mountain type dogs, like the Bernese Mountain Dog, Greater Swiss Mountain Dog, and St Bernard often had a dual guarding and herding role. These are often shaggy coated dogs, extremely resistant to cold, and some are known for their kindly temperaments and good disposition towards children. 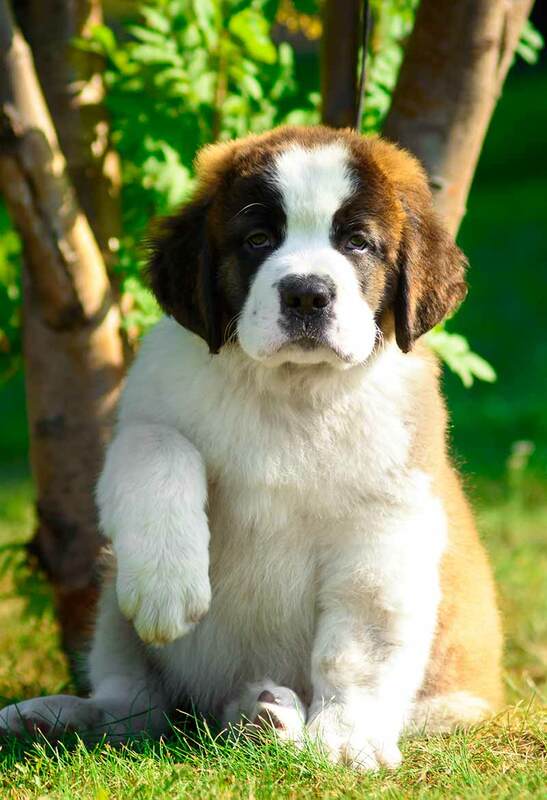 The Mountain dog breeds tend to have thick protective coats, and most will shed a lot of hair in your home! #Q What was the biggest dog ever? He measured 3 feet and 8 inches tall! Great Danes are heavy, though some other breeds are heavier. Remember, height is generally considered the best way to allocate the biggest dog in the world title, as weight can be more easily manipulated by overfeeding. There are four breeds here that stand out as being exceptionally tall. They are our two big hounds, the Irish Wolfhound and the Scottish Deerhound. The Great Dane – another hound like dog. And the immense Mastiff. #Q Where do the largest mastiff breeds come from? Mastiffs have been bred in many parts of the world. And an Italian Mastiff – the Neopolitan. And the rather rare Tibetan Mastiff which as its name suggests, hails from Tibet. #Q Are there many big white dog breeds? The Great Pyrenees and the Great Dane are the two big white dogs you are most likely to come across, though of course Great Danes come in other colors too. Being white, or predominantly white can, in some dog breeds, be associated with health problems. Often with deafness and sometimes with blindness too. As sometimes seen in white Great Danes. #Q How many big furry dogs are there? 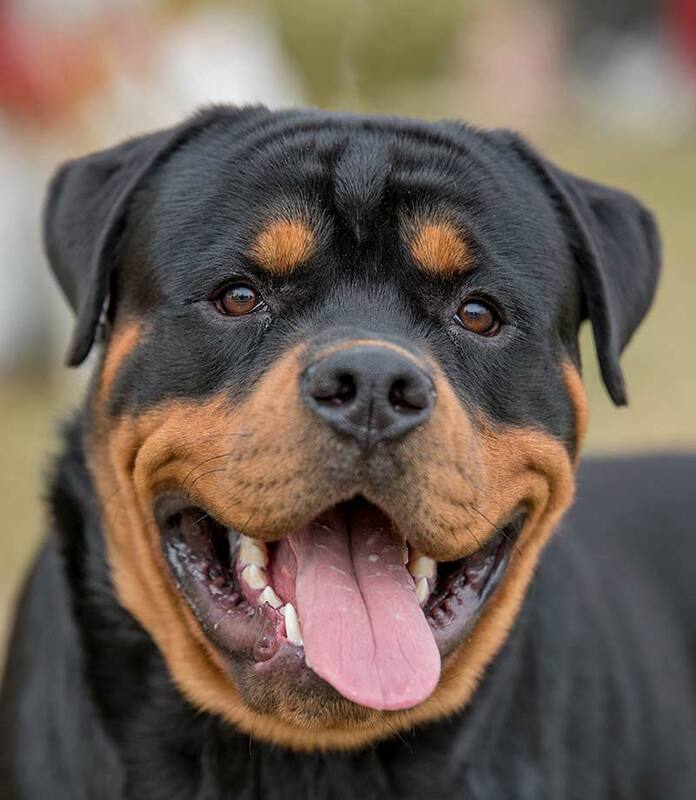 The Rottweiler, Dogue De Bordeaux, Mastiff, Bull Mastiff and Greater Swiss Mountain Dog, Boerboel, Neopolitan Mastiff and Great Dane have short flat coats. The St Bernard has a moderately short coat but it’s much thicker than that of a mastiff. So that makes 8 or 11, depending on which way you are counting! Some of these big breeds are very loving and considerate towards all small children. Others are more protective and may be problematic around children they don’t know. 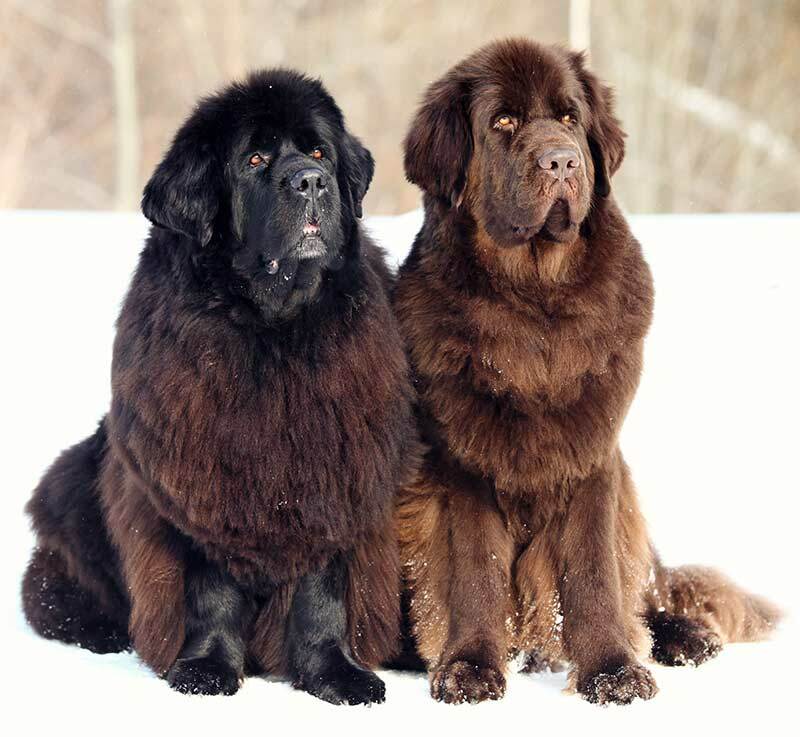 If you have little ones, either your own, or visitors to your home, then a gentle Newfoundland for example will be a better choice than the more active and protective Russian Terrier. Your choice may also depend partly on where you live. Quite a few of our giant breeds, were bred to work outdoors in cold climates. Large dogs with very thick coats can struggle a bit in warm climates. It’s easier to keep cool if you are small and heatstroke is a real risk in very large dogs. Remember that just because your guarding breed dog loves your children, it does not mean that your dog will love their friends, or your friends for that matter. Using a dog for personal protection is always potentially hazardous especially where kids are involved and requires serious planning, and thought. You also need to be aware that it isn’t really safe to bed share with a dog weighing ten stones. If you want to take the risk that’s up to you. But a giant dog should never bed share with children. It could crush a sleeping human without being aware there was anything wrong. 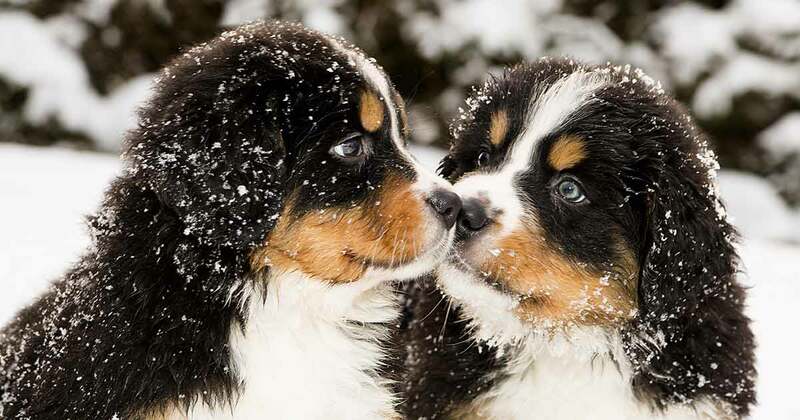 Our top favorite family dog from this biggest dog collection is the Bernese Mountain Dog. With the Newfoundland a very close second. These are both thoroughly nice dogs, with a great temperament. Being a giant dog isn’t always a bed of roses. In fact it comes with some disadvantages. We’ve looked at some of the health problems affecting each breed. But it would be wrong to talk about big dogs without emphasizing their health issues in general. 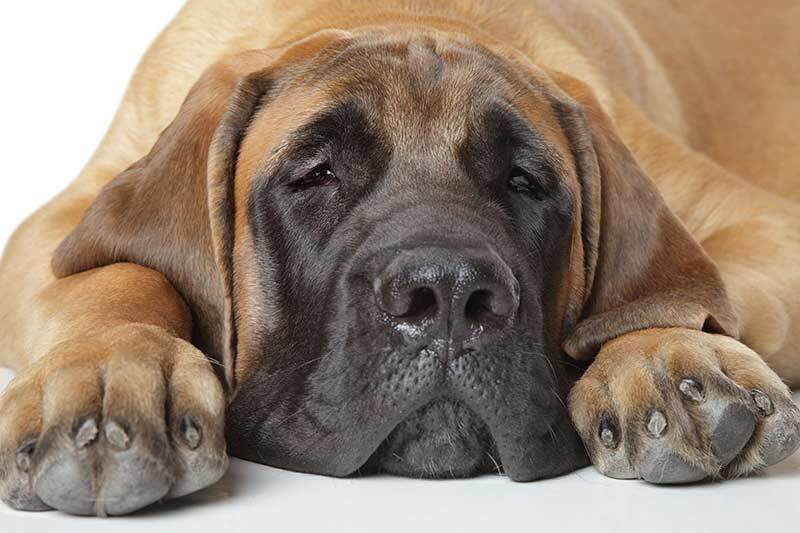 Gigantism in dogs is associated with reduced longevity. The median lifespan for a Great Dane is just six years. The Dogue De Bordeaux is even shorter. This is directly linked to their size. Compare those six short years with the fourteen years you can expect to share with a miniature Poodle. Six years might seem a long way away with a new puppy in your arms, but it comes around far to quickly for most of us. Apart from exaggerated size, most of our big breeds are reasonably well constructed. But not all. Dogs function best when their legs are in proportion to their spine, and when there is a defined muzzle at the front of the skull. And most of the largest breed dogs do fit this description. However, there are problems, with stresses and strains that a bigger body puts upon joints. And hip dysplasia is a problem in many big breeds. As is bloat – a condition that tends to affect larger more deep chested dogs. Some of our biggest dog breeds have suffered at the hands of their breeders. 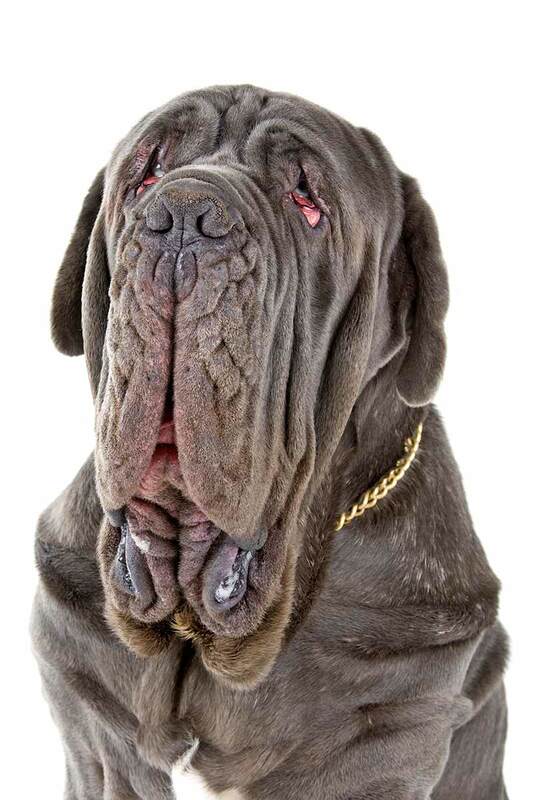 The Neopolitan Mastiff for example has become increasingly exaggerated in the last few decades. The excess saggy skin around the face means that the delicate membranes under the eyes are often exposed to the elements and become inflamed or infected. 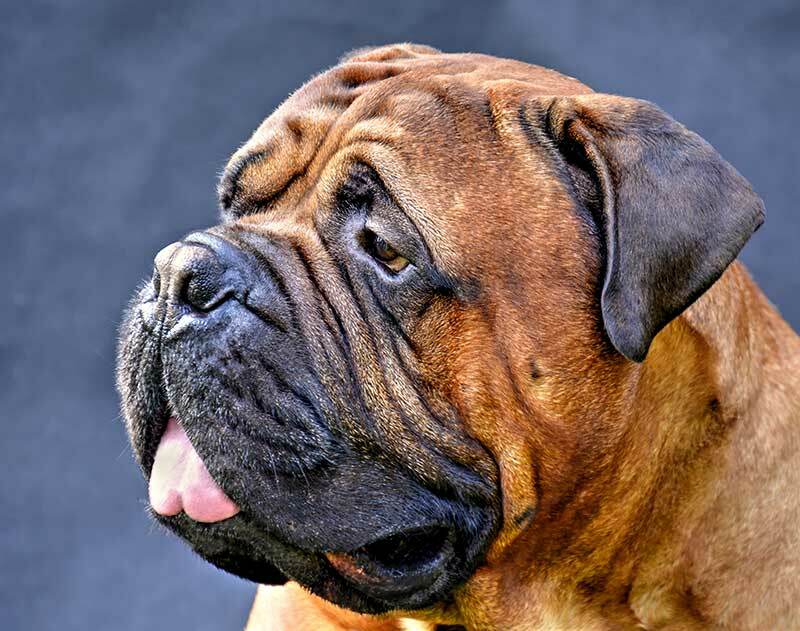 The Bullmastiff, and the Dogue De Bordeaux have become increasingly brachycephalic or short in the skull. This affects a dog’s ability to breath and cool itself efficiently. Although this practice is gradually falling out of favor internationally Great Danes are routinely ear cropped in the USA. Nor does a Great Dane or a St Bernard fit comfortably into many a modern home. So think about whether you can afford and have space for, a giant dog bed, giant crate etc. Orthopedic beds are ideal as they reduce the risk of the dog flattening the bed to the floor and help protect his joints. Some of the biggest dog breeds can produce a lot of drool, some shed a great deal of hair, and some do both. Ask yourself if you are happy to put up with this, and invest in a decent mop and vacuum cleaner! Many of our giant breeds have long thick coats and need quite a lot of grooming to keep them free from matted fur and smelling sweet. While you can probably get away with twice weekly grooming with your mountain breed, a daily routine will help to ensure that you don’t forget, and that the dog gets used to the process. Big dogs have big appetites, but many are susceptible to bloat so don’t be tempted to feed massive meals. You’ll need to divide your giant dog’s food ration between two or three helpings spread out over the course of the day, just as you do for your own meals. Using raised bowls is a risk factor for bloat, so you might want to avoid this too. Large breed puppies need to be fed very carefully to minimize what is often a high risk of hip dysplasia. Be sure to buy puppies only from health tested parents, and follow your breeders instructions carefully with regard to feeding and exercise. We hope you have enjoyed our collection of the largest dog breeds. These are stunning dogs with appeal as huge as their size. Being big is a protection against cold and against predators so many of our biggest dogs are livestock guarding breeds from mountainous parts of Europe. They can be at risk from overheating in hot climates. Many of the giant dogs are gentle creatures, but some have been bred to be very suspicious of strangers. Not all these biggest dog breeds are suitable as family pets. And, like all large animals, these powerful dogs need thorough training, socialization, handling, and supervision if they are to become safe canine citizens. Do find out what is involved before taking the plunge. The largest dog breed puppies can be very expensive. Both to buy and to raise. So make sure you can afford to maintain your new friend in the long term. But perhaps the biggest barrier to ownership is the health issues in these breeds. Some of our biggest dog breeds are quite rare and have genetic problems caused by inbreeding or by exaggerated conformation. Nature tends to punish gigantism, and sadly many very big dogs have lives that are far too short. Cancer, heart disease, and joint problems are rife in our biggest dog breeds. 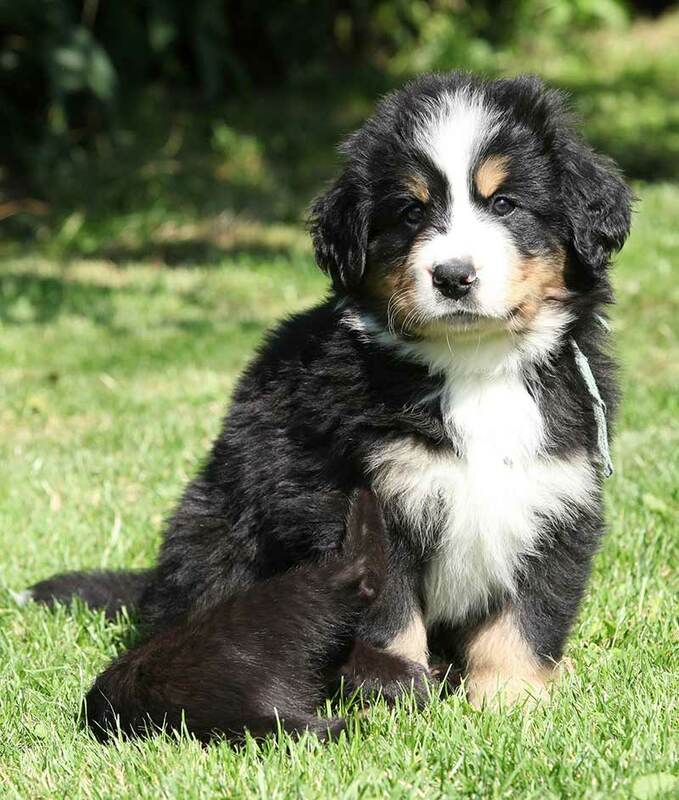 Our top choice for a pet chosen from the largest dog breeds is the Bernese Mountain Dog, and judging by his popularity, it would seem that many people agree. But in truth, his lifespan is far too short and our honest recommendation is that you look among the slightly smaller breeds for a longer lived and healthy best friend. As with any puppy, if your heart is set on a giant breed dog take your time and choose carefully so as to mitigate the risks as much as possible. Be careful when searching for a puppy to avoid saggy facial skin, short muzzles with noserolls, pinched nostrils, very high rates of cancer, or heart failure. Look at your potential puppy’s parents and make sure they are free from those features. Quite aside from reducing a dog’s length and quality of life, these health problems can generate some very nasty vet bills. Use our puppy search guide or read Choosing The Perfect Puppy before you make a final decision on buying one of these special beauties! I would like to ask regarding the temperament of Germany Rottweiler. We are thinking of getting 2 along with our English Bull Dog. Are they safe for adults, children and especially for our English Bull Dog and my husband and I.
I have trained 8 Chow Chows, 3 English Bull Dogs, being hearing impaired. These are smaller dogs then Rottweilers. We hear different opinions. Anything you can help us with would greatly be appreciated.